This week is 34 of this project, and with that, we are covering the 34th state of the Union, Kansas. Kansas joined the United States in 1861, having been a US territory since 1854. When it comes to beer history and Kansas, there is a big hole. An almost 67 year hole to be exact. This hole exists because Kansas had one of the longest prohibition periods in the country. Starting in 1881, a full 38 years before the national Prohibition and lasting until 1948, Kansas was dry for a full 67 years. Even with the lifting of prohibition in 1948, it still took another 39 years for citizens of Kansas to have the opportunity to experience a brew-pub in their own state. Kansas was a critical player of the temperance movement and was also the state where Carrie Nation came to fame. Responding to a call from God, she started smashing up saloons, first with rocks and then with her trademark hatchet, with what became known as hatchetations. Given the state of beer and brewing in Kansas, it is no surprise that acquiring beer from that state is still hard. However we were able to coming across a 4 pack of beer from Tallgrass brewing company. This beer, named the official beer of retro-gamers, is a pale ale called 8-Bit. With the label commemorating the 8-Bit graphics of our favorite classic video games, this is one colorful can. The can is so fun that there are even people selling (and buying?) empties on eBay. One of the more interesting items I discovered while researching the history of beer in Kansas, was a story about brewers clogs. During the brewing process, malt is cooked in a large vat and then spread out on the floor to cool. As the workers spread the malt out on the floor, they wore wooden shoes that were cleaned daily. These shoes were called brewers clogs. As part of the Kansas Historical Society collection, they posses a pair of brewers clogs worn by brewer Theodore Weichselbaum in Ogden, Kansas, were he owned and operated a brewery from 1871 until 1881, when prohibition kicked in. So, in a tribute to Theodore, this week we will model some shoes with our sampled beer. 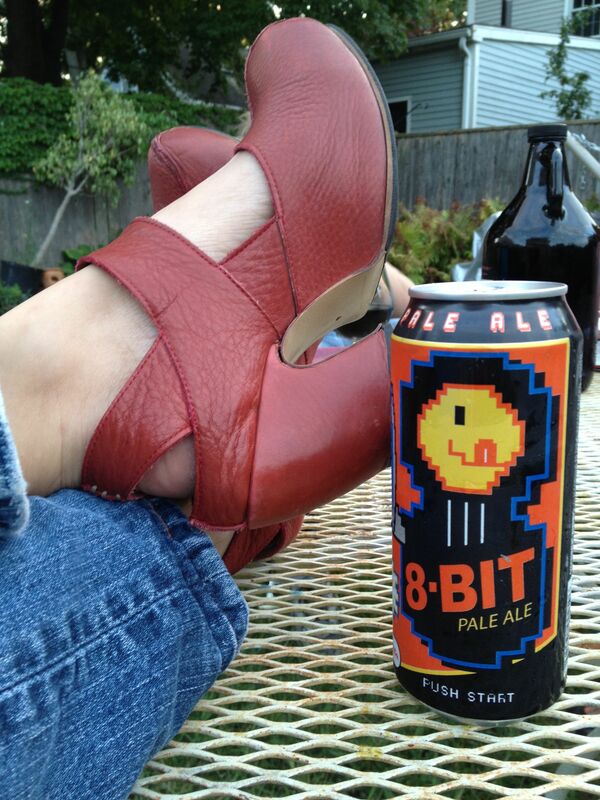 8-bit Pale Ale, and some shoes. This 8-Bit ale was a fun and enjoyable beer. It was light and refreshing and everyone quickly went back for more. An all around favorite. If you happen to get the chance, get yourself one. As we have discovered, while Kansas brewers had to wait for their government to change ways, they quickly stepped up with some wonderful beer. Sure we only have one data point, but this one point was enjoyable. Thanks for reading. Next week, West Virginia.